Lotus, the magical flower that grows in murky waters across India, Vietnam and other Southeast Asian countries is nothing short of spectacular. And I'm not just referring to its bright pink top that sits over water or its glorious roots that hang loose. I'm talking about a flower that beats all odds and survives between mud and water. A flower that brings together nature, spirituality, culture and science. And one, which is entirely edible and gives us not just foodstuff, but also medicines and tea. Lotus goes by multiple names: water lily, white lily, Nelumbo Nucifera or the Indian lotus and needs not just water but also abundant sunlight to grow. Culturally, the lotus holds an almost sacred spot in both, Hinduism and Buddhism. In Hinduism, it represents beauty, prosperity and femininity. Old texts suggest that the Bhagavad Gita used it to describe the ideal state of life. "Humans should strive to be like the lotus, work without attachment, dedicate their lives and actions to God and remain untouched from sin, bloom like the flower on tip, despite where it grows. Above mud, above water." The Lotus flower is also considered to be auspicious in China and in ancient Egypt, mostly because of its habit of retracting into water during the night and re-appearing again at the crack of dawn, as soon as the first light appears. This phenomenon has been associated with rebirth and with the rising and setting of the sun. In Buddhism, the lotus represents the purity of the body, soul and mind. The popular chant of nam myoho renge kyo is also referred to as the lotus sutra which puts you on the path to spiritual awakening. The lotus is one of the eight auspicious symbols of the religion and you'll find that it appears on most Buddhism texts, art, scriptures, etc. Sometimes Lord Buddha is seen sitting on a lotus flower with some leaves looking up and some looking down, representing that when Buddha nature comes into being, the lotus unfolds and blossoms. Lotus stems are delicious and I've always been a strong advocate of that. But till a few days ago, I was completely unaware of the string of health benefits associated not just with the lotus stem, but with the flower, leaves and seeds. According to The Traditional Knowledge Digital Library (TKDL), a unit of Council of Scientific and Industrial Research, ancient texts about the Indian system of medicine include practices where the lotus plant was used for the treatment of obesity and excessive hunger. 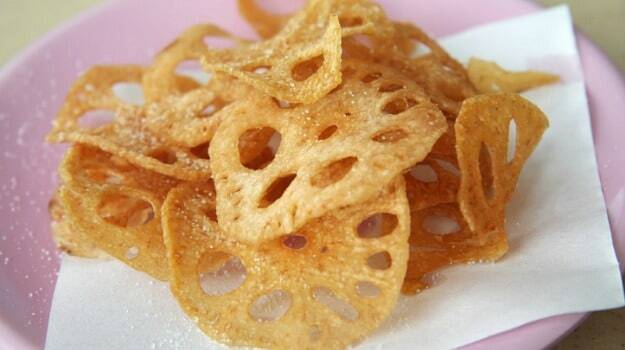 Lotus stem, also known as 'kamal kakdi' or 'bhen' is beige in colour with a hint of green, crisp and sturdy looking. It needs to be peeled, cut in the desired shape, soaked in salt water for 20-25 minutes before being used in your choice of recipe. According to Yuan Wang, author of the book Ancient Wisdom, Modern Kitchen, "Lotus root offers dietary fibre, vitamin C, potassium, thiamine, riboflavin, vitamin B6, phosphorus, copper and manganese. 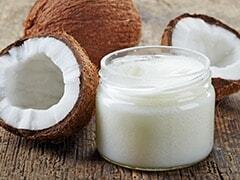 It may be helpful for managing high cholesterol and hypertension." She adds, "In Chinese tradition, fresh lotus stem is considered sweet and cooling, and is used to counteract summer dryness and horrid heat." 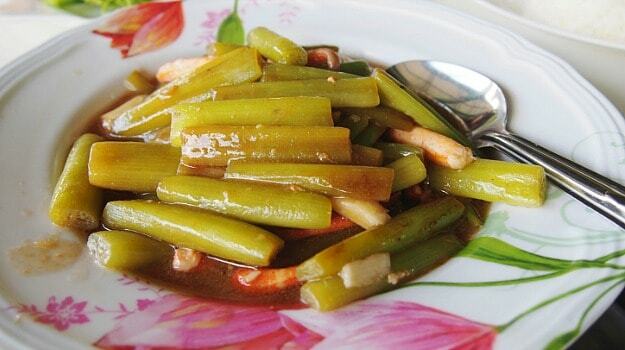 Lotus stems are used in stir-fries, stuffings, soups, etc. in Chinese cooking, especially in the Cantonese region. In Japan, lotus stems are known as renkon and are sautéed in soy sauce, rice wine and chilli peppers to prepare lotus chips, an extremely popular Japanese snack. Fiona Uyema, a Japanese food blogger writes, "lotus stems are not just low in calories but also help treat lung related illnesses such as asthma." In fact, a small amount of the juice from raw and finely grated lotus stems can also be used to treat tuberculosis and coughing bouts. Besides food, lotus stems are also used in cosmetics. A particular kind of lotus stem cell has been patented as an age-defying ingredient that helps repair damaged cells and restore regenerative function. A 2012 study also suggested that the lotus root can be used to cure non-alcoholic fatty liver disease by decreasing the size of the liver. Lotus petals, when used in tea can give green tea a run for its money. They're extremely helpful for a whole lot of reasons: they can help treat a range of gastric problems like bloating, diarrhoea and stomach cramps. They can help women with menstrual cramps and are known to be a boon for men and women dealing with reproductive problems. 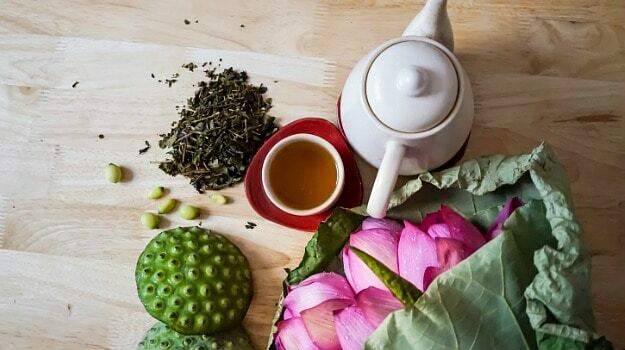 Besides the plethora of health benefits, lotus tea smells absolutely gorgeous and has a calming effect that helps a person unwind and de-stress. The lotus flower is also used to make cough syrup which soothes the aching throat. 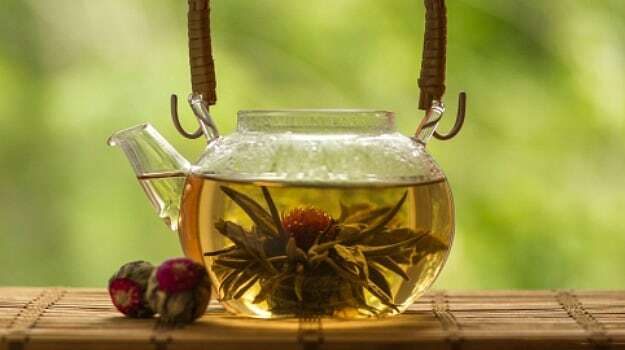 Lotus tea made with lotus petals is one of the most commonly produced and consumed teas in Vietnam and Thailand. It doesn't just strengthen the heart, but also lowers blood sugar levels and is a great weight-loss therapy. Another kind of lotus tea is the one made with dried and powdered lotus root. It's great to heal a bad cough, build health and strengthen the lungs, kidneys and the digestive system. Lotus leaves have been used for over 1000 years in traditional Chinese medicine and for good reason. Lotus leaves are pale, green and brownish in colour and are collected and dried before being powdered for medical use. They're rich in a wide range of alkaloids that help curb obesity, especially in middle-aged women. It's also cures diarrhoea, strengthens heart function and improves circulation. If weight-loss is your goal, then lotus leaves are your go-to remedy. According to Judd Handler, author of the book Living Healthy: 10 Steps to Looking Younger, Losing Weight and Feeling Great: "Sacred lotus leaves can speed up your metabolism which helps with weight-loss." In India, lotus seeds go by the name of Makhane and are eaten as a snack or used in kheer, especially during Navratri. Yuan Wang, author of the book Ancient Wisdom, Modern Kitchen, explains that lotus seeds can be eaten raw or cooked into a soup, crystallised with sugar to make sweets, or made into a sweet paste to fill Chinese moon cakes." 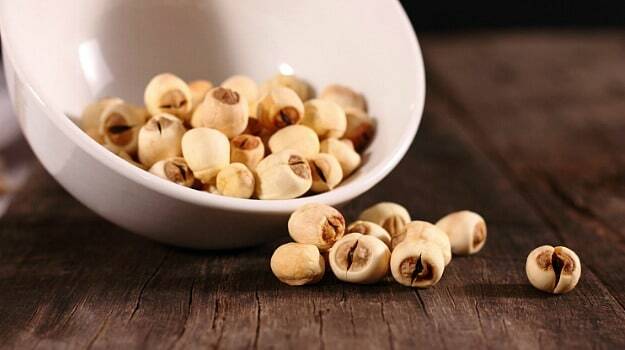 Lotus seeds, sometimes referred to as 'lotus nuts' have a slightly piquant taste and can be bought from any grocery store. Lun Wong writes in her book Food for the Seasons: Eat Well and Stay Healthy the Traditional Chinese Way, "lotus seeds support the kidney, treat diarrhea and help poor appetite." Lotus seeds are made of 20 percent protein and are usually used in a dry form. Like lotus petals, lotus seeds also help improve lung health, kidney functioning and digestion and are undeniably nourishing. They soothe and re-boot the nervous system and cure insomnia.